If you enjoyed Sue’s Hot Cross Buns at the Coffee Morning, or if you weren’t there and would like to enjoy some, here is the recipe. If you make them (Oh go on, they’re delicious! ), do send us a picture of the baking, the baker or the consumers in action! Put the flour and salt in a mixing bowl and rub in the butter. Beat the egg in a measuring jug and make up to half a pint with warm milk. While the dough is rising, grease or oil a baking sheet, make the marzipan or pastry for the crosses and the syrup for the glaze. For the crosses: either marzipan made with 2 oz ground almonds + 1 oz each caster and icing sugar mixed to a stiff paste with beaten egg. (The rest of the egg can be used to brush the buns before baking), or pastry made with 2 oz plain flour with 1 oz fat rubbed in and mixed to a stiff dough with a very small amount of cold water. Turn the risen dough onto a lightly floured board. Knead lightly to form a ball and divide into 12 even sized pieces. Shape into flat-topped rounds with the creases underneath (a bit like a burger shape). Place on baking sheet allowing room for them the spread. Roll out the marzipan or pastry to a rectangle about a ¼ inch thick for marzipan and a little less for pastry. Using the rolling pin as a straight edge trim off the uneven edge and cut strips to form the crosses. 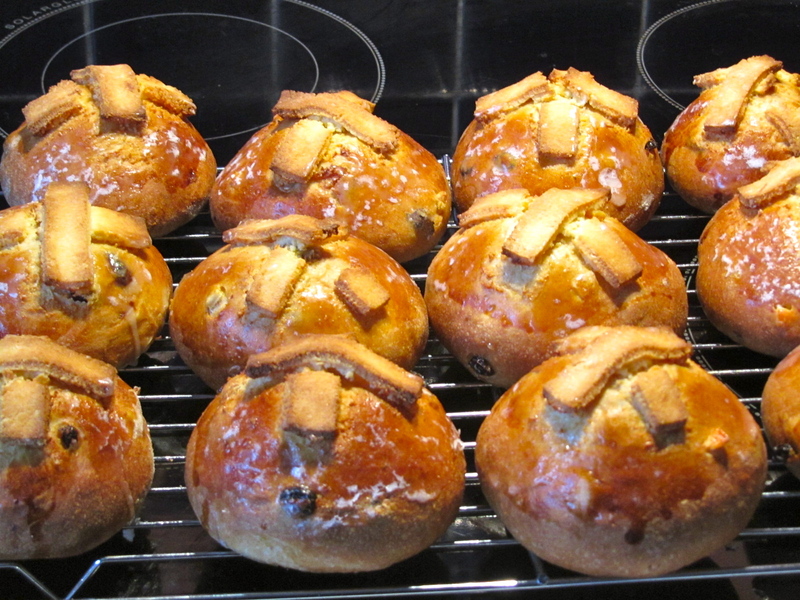 Brush the top of the buns only with beaten egg and stick on the crosses. Cover with a tea towel and leave to rise for about half an hour. Pre heat the oven to 200° C/180 fan/gas mark 5. Bake risen buns for about 15 mins until nicely browned all over including the bottom. While the buns are cooking, reheat the syrup glaze and have a pastry brush handy. As soon as the buns are done brush between the arms of the crosses with the hot syrup. Lift finished buns onto a cooling tray…………………….spread thickly with butter and enjoy!